Xul is a five piece band based in Vernon, British Columbia, Canada they were formed in 2008, since then they began writing music for what will be their first full length titled "Malignance" with eight brutal cuts, it was released in June 16th 2012, as an independent release, their style can be described as Blackened Death metal, taking influences from bands such as Dissection, Behemoth, and Immortal. 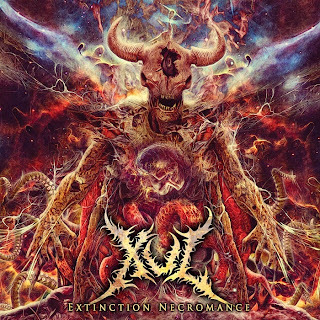 In 2015, they come to light their new production as an EP entitled "Extinction Necromance" which contains four tracks full of savagery, literally Xul will destroy you from the opener track "Frozen, We Drown", it comes to fuse brutality and tech death metal fast as hell and with the slow parts it's simply blunt, a guitar riff which comes from the bowels and growling vocals, this cut has wide range of textures to appreciate, then comes "Orbit of Nemesis" the symphonic intro doesn't prepare you for the sonic assault that this guys have crafted for you, overflowing tech death metal, there is a predominant riff along the track which sound incredible and will stick to you, "Chaos Requiem" falls in the more melodic Xul can offer us, but without losing the brutal contrasts, exceptional transition from fast tempos full of energy to the slowest tempos where melody take over, vocals are morbid and disturbing, the last cut is "Summon the Swarn" a peaceful intro that soon blast into a chaotic reverb, drums are possessed by an entity delivering a magnificent job with the drumsticks, this track shows up their skills at composition, instrumentation is devastating a killer piece, guitars are undoubtedly the best part of this epic track, which ends with the same peaceful chords, in my opinion this is the best track in "Extinction Necromance" EP. 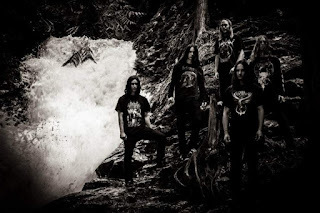 However, they fail miserably in production which doesn't help them to much to display their full potential in composition, they have a good riff, good pace, melody and technical, all well mixed with brutality, here there are plenty of elements to excel, however turns out by baffling their mixing choices, they ended up with a prefabricated sound.